Over the years I've had a wonderful opportunity to share with you some of the great puppets from Folkmanis Puppets . . . and I'm so happy to be able to do so again today. I already shared two of them with you (they were giveaways in my 2016 Christmas Month of Giveaways, some will be donated to Caleb's kindergarten classroom, others to a local ministry which helps families in need and little Shane seems quite "taken" by the Corgi!) so, today I'm very happy to let you know about some additional new puppets from Folkmanis - if you are looking for gift ideas for Christmas, think about these! Soft, plush and more than just a puppet! Attention is given to quality, design and detail - these are wonderful puppets! Folkmanis says; "New to the pride and bounding with playful energy, the Folkmanis African Lion Cub's soulful eyes and big ears highlight a sweet expressive face which comes to life magically with your imagination. Whether pretending to roam the savanna or hiding in the bush, you'll have an uproariously fun time with this lion cub. Offering heirloom quality and timeless design, the Folkmanis Brown Bear Cub puppet will come to life when you cradle this cuddly North American creature in your arms and work the movable head and mouth. With impressive size and weighted paws to add to the realism, delight your friends with bear hugs and kisses from your plump puppet friend. The Folkmanis crafty fox hand puppet sits up alert and ready for imaginative playtime. Feel the soft texture of his fur as you hold him close to animate mouth and forelegs.A diminutive dog fit for royalty, the Folkmanis Corgi hand puppet awaits your adoption. 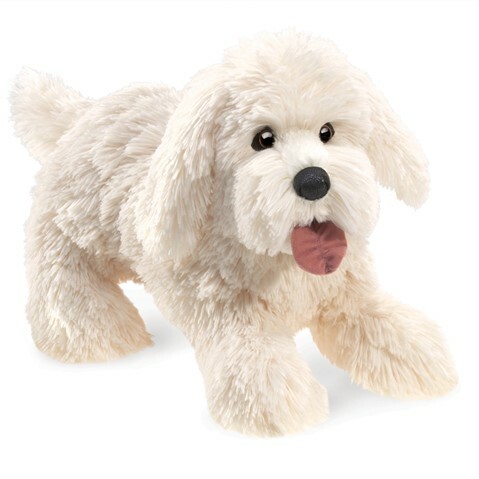 A tri-colored Pembroke in black, brown and white, this stocky pooch is the perfect companion for creative play." I love puppets! They encourage imagination and interactive play! I also love plush toys - they can be comforting and a stuffed toy often is a "first friend" to many children. Folkmanis combines the two for amazing plush toys which are also puppets! Plus, they often choose fun creatures - like a lion cub or a corgi - to make into puppets, which just adds to the fun! When this box of puppets arrived, my grandsons were here - they gave their enthusiastic approval to all four!